This map shows the terrrain of the USA in shaded relief. Higher elevations are shown in brown and tan, like the Rocky Mountains and Pacific Coast Ranges of the western United States. In the eastern U.S., the Appalachian Mountains trend from New England down to Alabama. You can see numerous rivers running across the country to the Mississippi River Basin, which drains everything from the Rockies in the west to the Appalachians in the east. Major lakes are also shown on the map, including the Great Lakes in the northeast, the Great Salt Lake of Utah, and Lake Okeechobee in Florida. Google Earth is a free program from Google that allows you to explore satellite images showing the cities and landscapes of the United States and all of North America in fantastic detail. It works on your desktop computer, tablet, or mobile phone. The images in many areas are detailed enough that you can see houses, vehicles and even people on a city street. Google Earth is free and easy-to-use. The United States of America is one of nearly 200 countries illustrated on our Blue Ocean Laminated Map of the World. This map shows a combination of political and physical features. It includes country boundaries, major cities, major mountains in shaded relief, ocean depth in blue color gradient, along with many other features. This is a great map for students, schools, offices and anywhere that a nice map of the world is needed for education, display or decor. 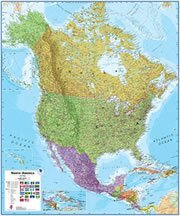 If you are interested in the United States and the geography of North America, our large laminated map of North America might be just what you need. 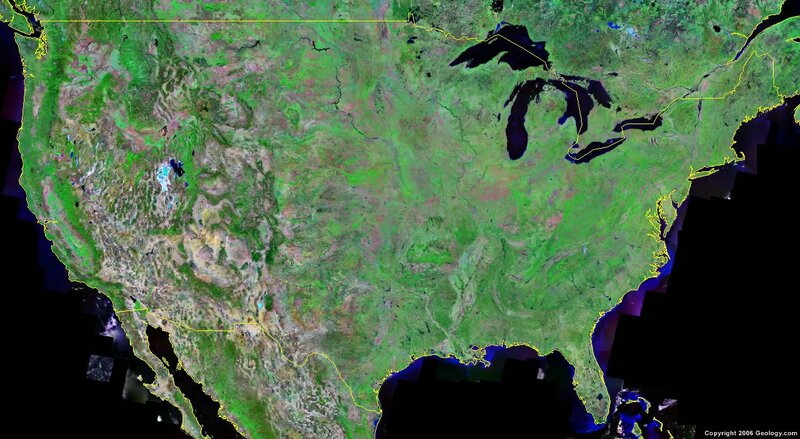 It is a large political map of North America that also shows many of the continent's physical features in color or shaded relief. Major lakes, rivers, cities, roads, country boundaries, coastlines and surrounding islands are all shown on the map. The United States is located on the North American Continent. The United States of America is bordered by the Pacific Ocean, the Atlantic Ocean, Canada to the north, and Mexico to the south. Albany, Anchorage, Annapolis, Atlanta, Augusta, Austin, Baton Rouge, Bismarck, Boise, Boston, Carson City, Charleston, Cheyenne, Chicago, Columbia, Columbus, Concord, Denver, Des Moines, Detroit, Dover, Frankfort, Harrisburg, Hartford, Helena, Honolulu, Indianapolis, Jackson, Jefferson City, Lansing, Lincoln, Little Rock, Los Angeles, Madison, Miami, Montgomery, Montpelier, Nashville, New Orleans, New York City, Oklahoma City, Olympia, Philadelphia, Phoenix, Pierre, Providence, Raleigh, Richmond, Sacramento, Salem, Salt Lake City, San Francisco, Santa Fe, Springfield, St. Paul, Tacoma, Tallahassee, Topeka, Trenton, and Washington D.C.
Appalachian Mountains, Atlantic Ocean, Casacade Mountain Range, Chesapeake Bay, Grat Salt Lake, Gulf of Mexico, Lake Erie, Lake Huron, Lake Michigan, Lake Okeechobee, Lake Ontario, Lake Superior, Lower Red Lake, Mississippi River, Missouri River, Pacific Ocean, Rio Grande, Rocky Mountains, Salton Sea, Straits of Florida and Upper Red Lake. The United States has some fossil fuel deposits of coal, petroleum and natural gas. There are a number of metal and metallic resources present, including copper, lead, molybdenum, uranium, bauxite, gold, iron, mercury, nickel, silver, tungsten and zinc. Other natural resources include potash, timber and phosphates. The United States has numerous natural hazards. There are hurricanes along the Atlantic and Gulf of Mexico coasts, flooding, mud slides in California, and frequent tornadoes in the midwest and southeast. Varied other occurrences include volcanoes, and earthquake activity around the Pacific Basin, tsunamis, and forest fires in the western portion of the country. In northern Alaska there is permafrost, which is a major impediment to development. The United States is the largest single emitter of carbon dioxide from the burning of fossil fuels. There is acid rain resulting from the air pollution of both the U.S. and Canada. Much of the western part of the country has limited natural fresh water resources, which requires careful management. The U.S. has water pollution from runoff of pesticides and fertilizers. There are also land issues regarding desertification.